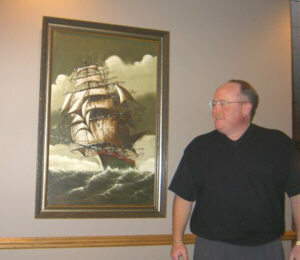 Spencer Dambro shows off his favorite art, an old painting of a square-rigger that once graced the Amerwood Inn on Genesee, run by his parents. The Brush/Lopez Group performs live jazz for an appreciative holiday crowd at Spencer's on Gratiot in Saginaw. Live jazz music weekly is what really sets Spencer's Restaurant, 5530 Gratiot Road, Saginaw Township, apart in the Mid-Michigan area. Spencer's is owned and operated by Spencer Dambro, member of a well-known Saginaw family of restaurateurs. Mr. Dambro designed and built the beautiful, light brick open-span restaurant himself three years ago and opened it on Nov. 19, 2001. "We've developed quite a clientele," says Mr. Dambro. Patrons include lots of jazz fans from out of town as well as dining aficionados. Spencer's features music weekly on Fridays and Saturdays like that provided by the Brush/Lopez Group, the Arlene McDaniel Trio, and Vanston/Eastham with Marcia Allen. The food is superb, also. Diners enjoy gourmet appetizers like escargot, Portabella mushrooms and calamari and entrees like Tuscan Chicken Giovanni. This diner chose a unique Governor Salad with huge shrimp and tenderloin and balsamic vinaigrette that was spectacular. Ieven took some home and it was great the next day. Pasta, of course, is featured (it's an Italian restaurant, after all.) The Seafood Ravioli sounds good, and The Tony Dambro Pizza is another specialty. "Have another glass of wine, it's worth the wait," suggests the menu slyly. Seafood is highlighted by poached salmon and pan-fried walleye, along with linguine with creamy clam, garlic or an intriguing Diablo sauce. Filleto Di Manzo tops the beef offerings, sauteed with onion, green and red peppers and the house specialty "Sophia" sauce. I can't wait to try the glazed rack of pork served with sweet and spicy red sauce. All in all, there's something for every taste on the Spencer's menu, the food is tasty and meticulously prepared and it's not expensive. The wide open interior with lots of original art on the walls provides a collegiate ambiance in the restaurant, and, add in excellent service, a good wine list, and good jazz music and you have"the whole Magilla," as an Irish friend of mine used to say. 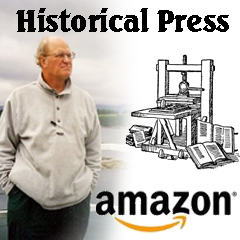 Twenty some years ago when a young Spencer Dambro was graduated from Marquette University, Milwaukee, Wisconsin, jobs in his field of Journalism/Advertising were scarce. "I had done some broadcasting at the ABC radio affiliate there in Marquette but even that experience wasn't enough to help much in a tight job market." "As much as I didn't want to get into the food business, I ended up there," the genial 44 year old entrepreneur recalled. So he went to Las Vegas and did what he had learned from his father, Tony Dambro. He worked in the restaurant field; well, more than just any restaurant, it was the famed Sands Hotel. He was the food and beverage supervisor at the Sands for three years, a pretty good apprenticeship for any future restaurateur. His ardor for the Vegas scene was cooling anyway, as the town was moving from more classy management, ironically provided under mob sponsorship, to trashy corporate manipulation. "Las Vegas was becoming congested and polluted and I had no desire to be back there," he recalled. "I feel like home when I'm here," says Mr. Dambro. "I believe in independent restaurants and I've shied away from suggestions that I franchise the Spencer's concept."